We started the morning pretty early. 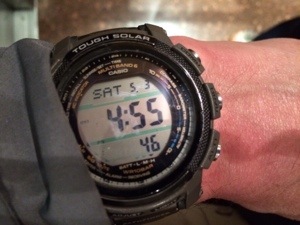 You’re probably glad you were not here with us because the wake up call came at 4:30 AM. The bus left at 5:00 and we started the Via Dolorosa at 5:30 AM. Why in the world would we do that? Because the streets of Jerusalem are empty and we own the place at that hour. 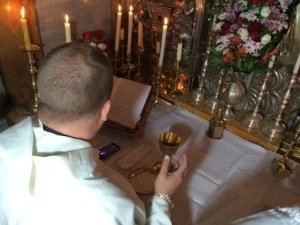 We can pray, stay together as a group and arrive at the Holy Sepulchre before the crowds. After praying the Stations of the Cross we all went up and touched the top of Calvary. I told our pilgrims that if they had touch that spot 2000 years ago their hands would come up sticky with the blood of Jesus. What a joy that was! People were in tears and overjoyed to have a private time inside the Tomb with no interruptions. What did I mean that Jesus came out of the tomb for us today? Think about it. When Fr. Courtney brought us the Eucharist, Jesus came out of the tomb for us again today in the form of the Blessed Sacrament. Jesus comes out of the tomb again for us every day – for our healing, spiritual nourishment, forgiveness and eternal blessing. 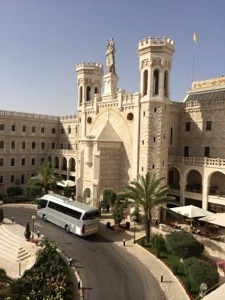 After walking back to the Notre Dame hotel for breakfast and a bit of rest we boarded the bus again to visit Mount Zion and the Mount of Olives. Today was a rich blessing for everyone. We gave everyone the afternoon off to go out exploring, shopping, praying at the holy sites or whatever the else they wanted. 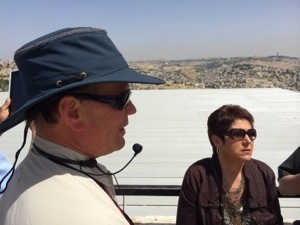 Teresa Tomeo is taking a group out to a nice restaurant in the old city of Jerusalem and Janet and I are taking a group up to the rooftop restaurant to eat overlooking the city of Jerusalem. We also have a Holy Shroud of Turin exhibit planned for the whole group this afternoon. What a joy all of this is!